Broadcast is one of those bands that we didn’t pay too much attention to the first time around. For whatever reason we never heard them at the right place or at the right time and they completely stayed off of our radar. We try not to get mad when we “missed out” on something though, because really it’s an opportunity. To hear an album fresh for the first time, to get to explore an entire band’s catalogue, to be older and wiser with different tastes - these are all good things. The next time you hear that someone hasn’t heard that band that you think everyone has heard, don’t make them feel bad about it - congratulate them! Hearing things for the first time only happens once. 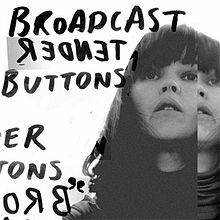 Broadcast’s “Tender Buttons,” their third album, is a fabulous intro to the band. Broadcast makes electronic music that is poppy, or pop music that is electronic, and mind you - we have a very warped sense of what is “poppy.” “Tender Buttons” is one of our favorite albums recently, and we’re just getting to know it. Give it a shot and tell us what you think. [Spotify Album Link Here].